Yogi Bhajan was born Har Bahjan Singh Puri in 1929. At the young age of 8, he had the grace to learn with a great master Sant Harzara Singh. 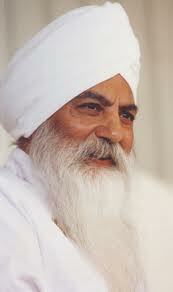 Under his guidance, Yogi Bhajan became a master of Kundalini Yoga at the age of 16 and a half. He studied economics at University. He went onto the army and worked as a transport officer and then worked in tax and customs for the Indian Government. Yogi Bhajan was married and had 3 children. In 1969, Yogi Bhajan brought the teachings of Kundalini Yoga over to the West. Originally a yoga practiced by few privileged Yogis and royalty, it was shrouded in secrecy. Yogi Bhajan realised, however, that we needed a technology, a householder’s yoga to help us meet the challenges and stresses that were to happen as we made the transition from the Piscean Age to the Aquarian Age. His motto was that he was here to train teachers, not to gather students. Through his tireless service, many teachers were trained. He set up a foundation called the 3HO which stands for Happy, Health and Holy. Yogi bhajan died in 2004 and he left a legacy that continues to thrive and spread throughout the world to help us to share the teachings of kundalini yoga with humanity. Recognise that the other person is you. There is a way through every block. When the time is on you, start and the pressure will be off. Understand through compassion or you will misunderstand the times. Vibrate the cosmos, the cosmos shall clear the path.